Walking with wrist weights will build upper-body strength and muscles. When you use hand or wrist weights of 1 to 3 pounds while walking or doing other aerobic exercises, your heart rate goes up by five to 10 beats per minute. It can also increase your oxygen use and calorie burning by approximately 5 to 15 percent, as compared to doing the same activity without using weights. Muscle mass dwindles down naturally as you get older. “If you don't do anything to replace the lean muscle you lose, you'll increase the percentage of fat in your body. But strength training can help you preserve and enhance your muscle mass – at any age,” says Edward Laskowski, M.D., co-director of the Mayo Clinic Sports Medicine Center. Walking with wrist weights tackles both aerobic exercise and strength training, which are necessary in maintaining good health. Strength training helps increase your bone density to lower the risk of osteoporosis. It also tones your muscles to make it easier to control your weight by burning calories more efficiently and lowers the risk of injury by protecting your joints. Strength training gives you better balance, builds stamina and helps you focus or improve your attention span. It can also reduce and manage a number of chronic conditions, such as arthritis, depression, osteoporosis, diabetes, back pain and obesity. Walking at any pace for as little as one hour per week lowers your risk of developing coronary artery disease. Walking longer and more vigorously can lead to a greater reduction of health risks. Hand weights, ankle weights and weighted vests are other options you can include in your walking regimen that will increase cardio intensity. 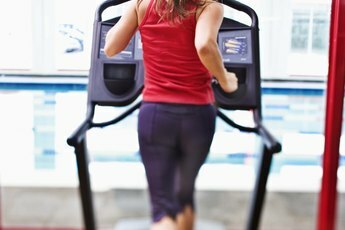 A study on the effects of ankle and wrist weights conducted by the University of Alberta in Canada determined that weights increased training intensity and energy – or calorie expenditure – during treadmill running, and may result in a bigger increase in cardiovascular fitness and weight loss than training without them. When used properly, walking with weights can improve cardiovascular conditioning. You should walk normally when using wrist weights by swinging both arms back and forth, as if you weren't wearing any weights at all, to keep your body in proper form. You should bend your arms at a 90-degree angle and hold them close to your sides. 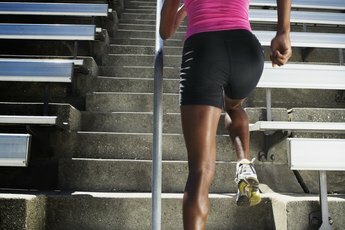 Start out with a 1-pound weight and gradually build up to 3 pounds after establishing a stride that is comfortable for you. You can use wrist weights while walking briskly, up and downhill or step climbing to change up your walking routine and burn even more calories. Most importantly, make sure you choose the right “walking shoes.” They should be lightweight, cushioned, low-heeled and fit comfortably. Keep in mind that there are certain risks involved with walking with weights of any kind. However, the American Council on Exercise, or ACE, says that the benefits greatly outweigh the risks, as long as it is done right. Try not to walk too fast so you can focus on your gait and balance. If you decide on a faster pace, take faster steps instead of lengthening your stride, to avoid putting excess strain on your legs and feet. Walking with weights can tire you out more quickly and can cause improper form. To avoid the risk of straining or pulling muscles in your arms and shoulders, do not over-exaggerate the swinging motion of your arms. The American Council on Exercise: Do the Benefits Outweigh the Risks if Individuals Hold Dumbbells in Their Hands While Doing Step Aerobics or Other Cardio Activities? Patti Davis has been a certified dietary manager since 2000 and has worked as a health and fitness writer since 2010. Her articles have been published on The Nest and various other websites. Passionate about health, nutrition, weight loss and fitness, Davis enjoys providing individuals with accurate information so they can make informed decisions about their lifestyle habits. Does Wearing Ankle and Wrist Weights Add Intensity to Walking? Is Brisk Walking Considered a High Impact Exercise?